On may 13, 2013 I will be out of work for 2 years now. I live with my youngest daughter who is 22 years old and have 3 children of her own. She have a good job that support her and children very well. But, after 2 years of supporting me too she is having difficulty with paying my phone bill, feeding me, buying personal items, watching my clothes etc. She don't complain but I know it's taking a toll on her emotional and physical. I apply online every day for all kind of jobs even jobs who just require high school diploma and still I get no respond. I'm starting to think my former employee is giving me a negative report since we departed in a bad way. Anyway, I recently apply for this position as a food assembly at gate gourmet and I have this good feeling about it so I'm asking you would you please help me pray to Our Lord and Saviour to bless his child in receiving this position in the name of his Son Jesus Christ. 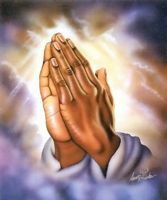 I Thank you in advance for your prayers.